Today Amazon launched their new AppStore for Android. Already, the AppStore has caught the attention of thousands, including Apple; who just filed a lawsuit against Amazon for using the trademark name “App Store.” Launch day makes available 3,800 apps, which pales in contrast to the Android Market’s 200,000+. 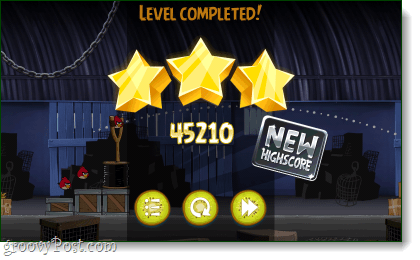 But, the Amazon AppStore has some exclusive titles not see on the regular market, such as Angry Birds Rio –which they are giving away free for a limited time to promote the launch. What is so great about Amazon’s Android Market? 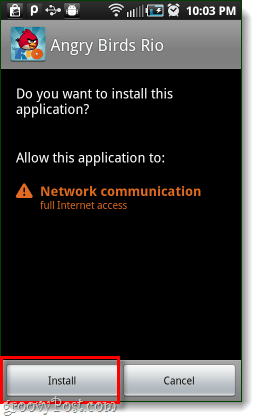 Well, at this point there isn’t much reason to use the Amazon AppStore, save for two things. 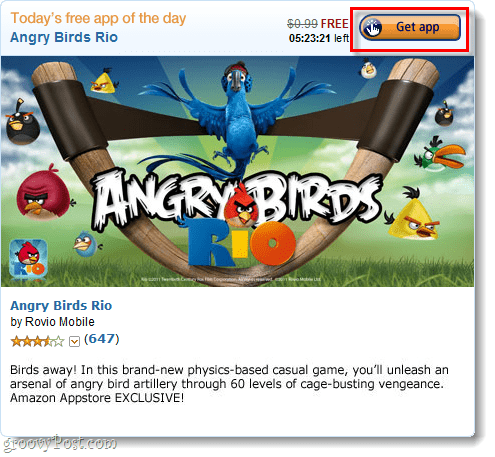 Amazon will be offering 1 free paid-app every single day. And, Amazon has a new Test Drive drive feature that gives you a 30 minute demo of an app before you buy it. Note that the Test Drive only works from your computer’s browser, uses flash player, and is only available on a handful of apps. Note: Before we get started make sure that you have your Android phone set up to allow applications from unknown sources, this is required to install the Amazon app. We have the instructions below, but Amazon also made a video featuring Paul Hochman that explains the process. You can check it out, or keep on reading! If you are already on your phone, just Tap here to download the Amazon AppStore app. 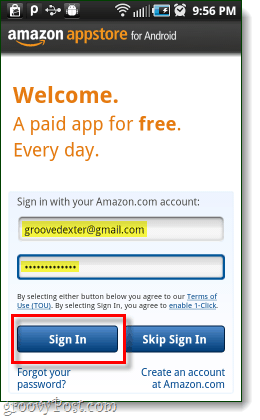 A small pop-up should appear, Type in either your mobile email address or your phone number. 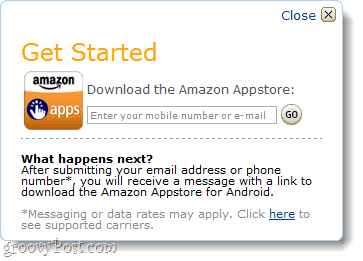 Amazon is going to send you a link to download the Amazon Android AppStore app. 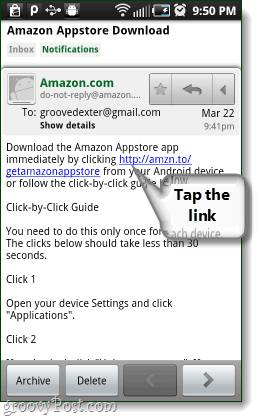 Now on your Android phone or tablet, Tap the link that Amazon just sent to your email or text. 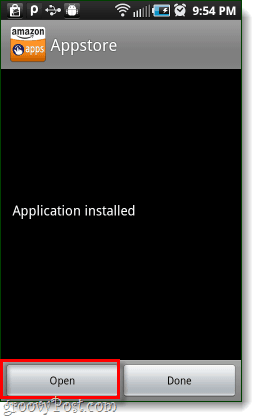 The Amazon_Appstore-release.apk should automatically start downloading, once it is finished –Tap it. 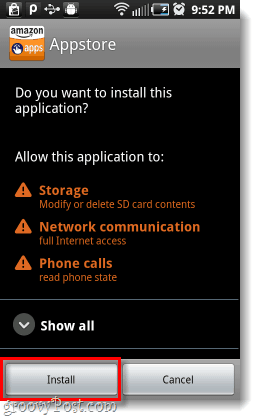 Now you’ll be asked if you want to install the Amazon Appstore application. Tap Install and once the installation finishes Tap Open. 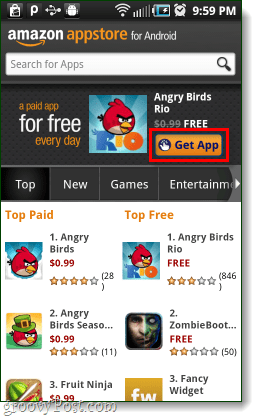 Now your Android phone or tablet is all set up for using the Android AppStore. So, with that done we’ll take a look at actually making use of it. Assuming you are logged in, you can browse through the apps and download them quite easily. At the top of the homepage of the app, Amazon will list a featured free app every day. To download any of these, just Tap the Get App button. 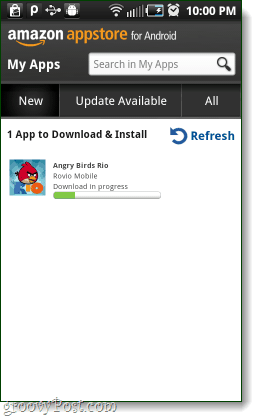 The app should automatically start downloading. Once the download is finish, it will automatically ask you if you would like to install the app. The rest works just like any other app on your phone! The setup process for the market is a little complicated, though once installed it super easy to use. If you’re concerned about developers, Amazon is offering the same deal to developers that the Android Market is; a 30% fee of the sale price for each app sold. But, if an app becomes a “free app of the day,” Amazon will still pay the developer 20% of the regular purchase cost per download. Amazon has said that they will be charging a $99 annual fee to their developers (Google only charges a one-time $25 fee), but currently are waiving the fee for the first year. The Amazon Android AppStore is here, but only time will tell how far it goes. AT&T Acquires T-Mobile USA – We’ve Come Full Circle!